Thesun Health Laser Ltd is a global online marketplace for used cosmetic laser equipment. We sell inspected used cosmetic/aesthetic lasers at affordable rates (about 75% discount) to both medical professionals and other companies worldwide. All our machines are in good operating state and come with a warranty. This what your Thesun Health Lasers ltd Blog Ad will look like to visitors! Of course you will want to use keywords and ad targeting to get the most out of your ad campaign! So purchase an ad space today before there all gone! 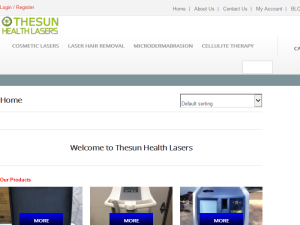 If you are the owner of Thesun Health Lasers ltd, or someone who enjoys this blog why not upgrade it to a Featured Listing or Permanent Listing?